Workshop is after the April VTMQG meeting. 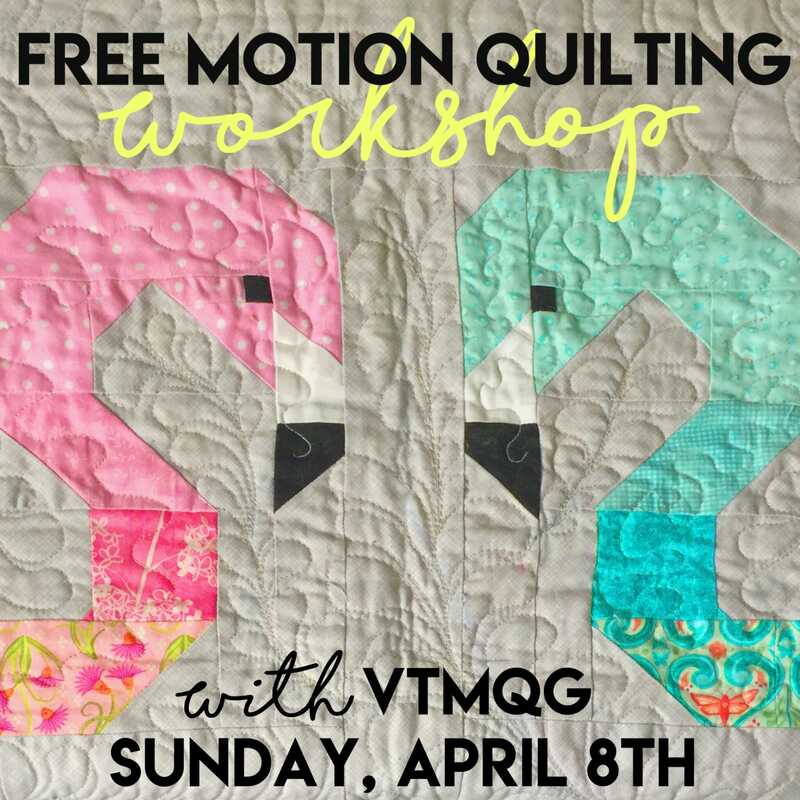 – About the Workshop: Join VTMQG’s Katherine Zachary for an afternoon of Free Motion Quilting! Create a sampler of stitches while learning meandering, free motion vines, feathers, and flowers. Participants will also practice linear quilting with use of a walking foot and just a few registration lines. Leave the workshop with a wall hanging stitch sampler and the confidence to quilt on your home machine! – About the Instructor: Katherine Zachary is an accomplished quilter of 35 years, whose work has been featured in the Shelburne Museum, Vermont Quilt Festival, and Quilters Newsletter. Her quilts are often embellished with beadwork, embroidery, big stitch quilting, and tiny paper-pieced blocks. After two terms as a New York judge, Kathy move to Vermont in 2006 and taught quilting classes at her local shop in Bethel. She enjoys quilting as it promotes artistry that was once only “woman’s work,” now elevated to an art form that everyone can enjoy. She shares, “It continues to be an opportunity for women to come together to enjoy each other’s company while also providing a platform for learning and sharing.” Thank you Kathy for sharing your passion of quilting with us! – Supplies: Participants should bring a sewing machine that permits sewing with the feed dogs disengaged, a quilting or straight stitch foot, a walking foot, 30 to 50 wt. cotton thread, and a 30″ square block sandwiched with low-loft cotton batting. For the block, the top layer of fabric can be muslin or a solid-colored cotton, and the back can be any cotton fabric, solid or patterned.